Come August 23rd, I check out AT&T’s More You Share, More You Save Mobile Share plan. Wait, what? 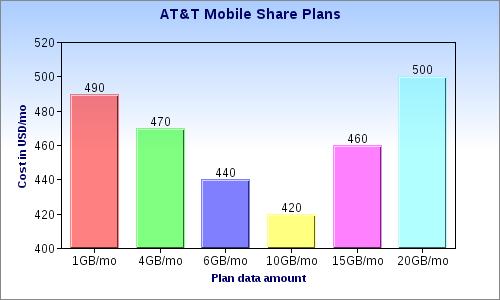 So now I’m supposed to pay $150/mo versus $45/mo to share 4GB between two lines…the 1GB Mobile Share plan is not much better, it would be $120/mo, still over 2x the cost for less data. 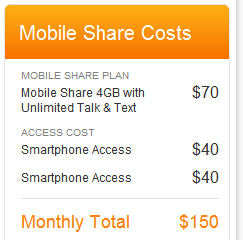 That makes no sense, I could buy two $30/mo for 3GB of data plans for both phones twofold for less expense! users save money with more devices!”, you may say. No, not at all. Lets say you have 10 devices (the max) on a shared data plan. Sharing 20GB between 10 devices would be $500/mo. Evenly spread, each device gets 2GB of data. Okay, maybe I want to a smaller cap, would that cost less? I made graph for your own viewing. And now consider that I could get a 3GB/mo plan for every one of those ten iPhones individually for $300/mo. “But I have some devices that use more than 3GB/mo and others that need data but use less than that!“. You can get the 5GB/mo plan for $50/mo for those devices that use a lot of data and the 300MB plan for devices that merely sip bits. The overage cost for the 5GB/mo plan is $10/GB over the cap. If you’re using more than 5GB/mo on your device, $10/GB should be a negligible amount to pay at that rate of usage. It seems like the days of buying just “internet” are over. We used to just pay for the pipe, the connection, and could choose the size of the pipe, bandwidth, and go about our own business with it. Now our pipes have filters on them, they aren’t really pipes, either, more like barrels of varying sizes which we pay for and fill up with data usage. It’s the pipe to barrel evolution. I wonder who AT&T expects to rope in using this new scheme. Users who want to FaceTime over 3G, perhaps?